Homes are a huge reflection of someone’s personality. Home design is so closely linked with the owner that it can be a mode of self-expression, much like clothes, hairstyle and other reflective artforms. There are thousands of things in someone’s home that can give away the owner’s character. From the home itself to the things inside of it. But maybe you want to go that one step further and have interior design and decoration that are entirely exclusive to your home. Something that nobody else has. Certain touches that speak volumes about you and your interests, aspirations and passions. Well, what better way to do this than to make things yourself. Nobody else will have the same end product and it adds an extra special personal touch. Here are some ideas to get you started. Every home needs at least one mirror but ideally you should have plenty. Not just for vanity reasons, mirrors make a great statement piece. They offer much more than a simple means to check how you’re looking. They can make rooms appear larger. They can reflect light into partially dark rooms. A floor length mirror near your door will help you fix any wardrobe errors before you leave the house. Bathroom mirrors are handy for doing makeup in- why is the light always better in the bathroom?! We could go on. But if an unframed or plain framed mirror feels a little dull, there are several ways that you can personalise a mirror. Here’s the easiest. So you’re bored of your plain bordered mirror. You want something a little more exciting than plain wood around it. Well, make things a little more exciting. See the plain wood as a potential canvas and turn your mirror into a piece of artwork in its own right. There are plenty of things that you can attach to the wood which will completely cover it and look much better in your home. If you have a cosy cabin kind of home, pine cones could do. If you have a brighter interior, try out fake flowers. You could use thick rope for a nautical look. Use a patterned fabric to give a cute dash of colour to an otherwise plain room. The options are endless. Use your imagination. Be eccentric. Experiment. Get creative. One mirror with a plain frame. A handheld hot glue gun. Lay the framed mirror on a flat surface where it has no possibility of falling. A broken mirror is the last thing we want. Especially if you’re superstitious. When your mirror is ready, pull up a seat or shuffle closer (maybe you’re on the floor). Make sure your glue gun is plugged in for it to heat up. Work out how you’re going to arrange your accessories on the frame. Once the glue gun is hot and ready to go, add a layer of hot glue directly to the frame itself. Instantly stick your accessory on. If your accessory is small, like a pine cone, glue one on at a time. Hot glue dries quickly, so you shouldn’t coat the entire mirror and then attempt to start sticking the cones in. You simply won’t have time. Take your time and be precise. It’s easier to do a good job first time round than to try to rectify mistakes later. If you think you might want to change your mind later, there is now the option of non permanent glue. Glue dots from Glue Guns Direct will safely and firmly stick whatever you choose to your mirror frame. However, low tack or high tack dots are easily removable. If you simply don’t fancy the mess created by standard glue gun sticks, there are also super high tack dots that are permanent. Once you have finished, leave the mirror for a few hours. Don’t attempt to stand it up. This will give the glue a chance to dry and the accessories to settle in place. Once the frame has been left to stand for a while, it should be good to go. Hang it on your wall and admire your handywork. If you simply want a plain colour, you can use wood paint to paint the mirror instead. Just remember to avoid getting paint on the mirror itself and to give it plenty of time to dry. Blinds may be sleeker in design, but if you want a truly personal touch for your windows, why not make your own curtains? Curtains make any room feel cosier and they’re simple and cheap to make. Store-bought curtains are often plain and generic. So why not create some in the perfect shade, pattern or style to match in with your room? Take a few moments to consider what will and won’t work. Then head out and get the fabrics. 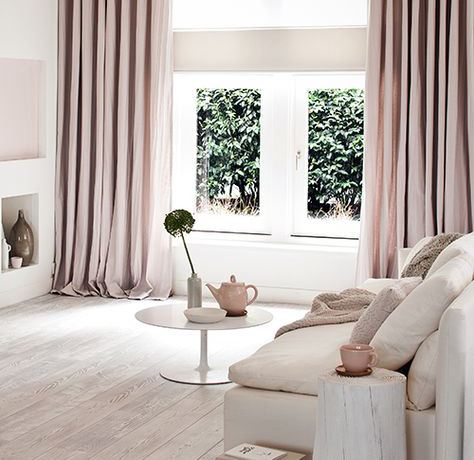 Firstly, you will need to measure your windows and how long and wide you want your curtains to be. Once the measurements have been taken, you’re good to go. Cut your fabric to the correct length. You’ll want one, solid sheet. If you mess up, call it a loss and start again. You don’t want wonky or patchy curtains. The rest is fairly simple and straightforward. Fold your fabric at the top over and stitch to the main body of fabric in a straight line. Leave enough room for your curtain pole to go through. Then do the same but only one inch thick around the remainder of the curtain. This will give it a cleaner, better finished end result. Et voila. You’re done. Pretty easy, right? Hang them up and feel proud of your creation. Have you done any home decor crafts this year so far?